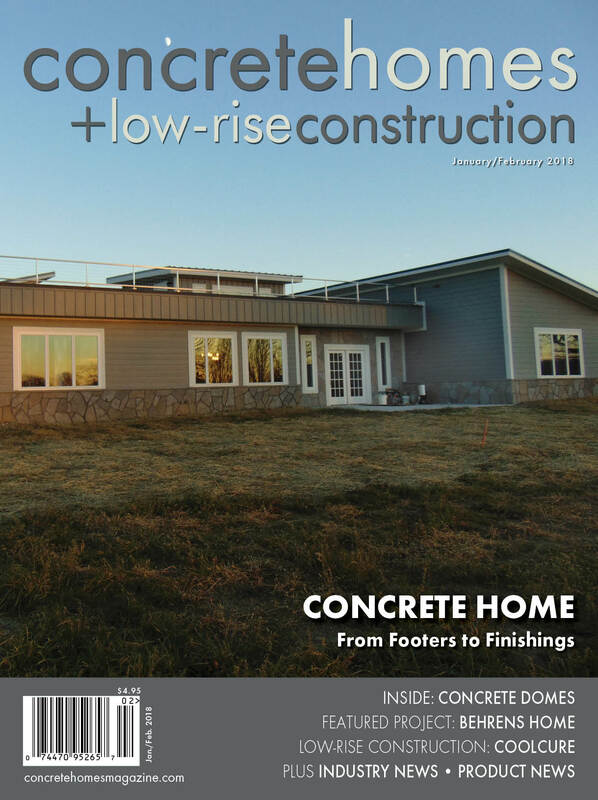 As the editor of Concrete Homes + Low-Rise Construction, which publishes bimonthly, I’m responsible for finding a cover home to feature. This one was the featured home in the January 2018 print issue. For Indiana homebuilder Jon Bell, one recent job ended up being much more than he expected it to be. Bell originally was hired just to pour flooring, but as the homeowners, Paul and Laura Behrens, learned more about how versatile concrete is, they kept wanting more. Paul is a chemical engineer with a doctorate. The couple moved to Indiana from Chicago to be near family and to Bell, they were the most interesting customers to work for because Paul didn’t just want to be part of the decision-making, He also wanted to know how the concrete was performing on a molecular level. The home used Fox Blocks ICF, and the concrete not only extends to the home’s outside—the interior walls are 8-inch thick concrete also. Bell and his crew poured the floors, then poured the interior walls and then decorated all of it once it was done. For Paul, his decision was all about safety, efficiency and function. One of Paul’s brothers built an ICF home in Minnesota, so Paul learned first-hand how efficient they were at staying warm during cold winters. Paul says he wanted a home strong enough to withstand tornadoes. “I thought ICF would be an interesting way to insulate and perhaps make it easier to do different things,” Paul says. Laura was in charge of the style, and the decorative concrete world wasn’t on her radar at first. In Paul’s office, the floor is simply a clear coat on ground-down concrete and one of the walls is poured concrete in its conventional form, but tinted. Paul says visitors remark that it’s like being underwater. Then Laura showed Bell a photo of some concrete that looked like wood. That opened up the world of decorative concrete. Bell installed an 8-by-8-foot shower with a large bench in it all out of concrete. That was finished with a Stone Edge Surfaces overlay that makes it look like marble. “We took Surfkoat’s metallic pigment and mixed that with our microtopping and troweled that on the wall and once we sealed it it gave that metallic marble look,” explains Bell. In the master bedroom, three ICF walls were drywalled and one interior wall was made to look like wood plank. That wood look continues into the laundry room and the two guest bedrooms. Some decorative elements, like a tile border around the floor, soften up the all-concrete look. The plank look continues into the kitchen with a cross-hatch look in each plank along with a 3×3-foot squares done with a metallic pearl epoxy and a brown plank square with white pearl epoxy. That contrasts with the plain gray concrete breakfast bar with exposed the aggregate and a rock chip face. One challenge was the 4×6-foot foot butcher block concrete countertop island. “We actually built a butcher block table out of pine, sanded it sealed it and made a rubber mold of it,” explains Bell. Bell used Bill Kulish’s Steelike concrete mix, which gets to 25,000 to 30,000 psi but will mirror anything you pour. At first, Bell didn’t think his mold had succeeded, but after spraying on some caramel and brown stains and lightly sandpapering, the wood grain came out. An ashlar slate pattern runs along the floor through the game room and hallway down to the bedrooms. Three bedrooms are carpeted, and all the other flooring is either epoxy or overlay. Since they opted to not include solar panels, the family does enjoy the roof space. The home’s front entryway is two stories with a staircase to walk up to the top of the roof, along with space for what could be an elevator shaft. Thanks to the concrete roof panels the family can now go onto the roof, where they installed a stainless steel cable railing around it, thus providing the grandkids a safe place to play. “We put ‘torch-down’ asphalt membrane over the concrete roof, then 2-inch thick foam board for insulation and then patio pavers,” says Paul. “It’s an area where we like to sit and look at the night sky,” says Paul. The master suite is on south side of house to capture warm sunlight and the guest rooms are on the other side so those don’t need to be heated and cooled at all times.